No bird stuff on seats! This is a nice looking cotton cockpit cover that lets you keep the interior clean and much cooler than sitting in the sun (no fading). Velcro straps hook over the wipers and door handles and rear tabs are locked into the trunk. Looks good, easy to use! 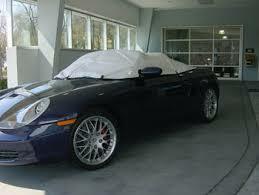 Protects against light rain and gives you time to get the top up after you realize that it has started raining. It is a light khaki color cotton, a material no longer available from the manufacturer. $50 plus $15 shipping in US. It works so well that I bought one for my 987. This one is in very nice shape. Ready to buy. PM sent.